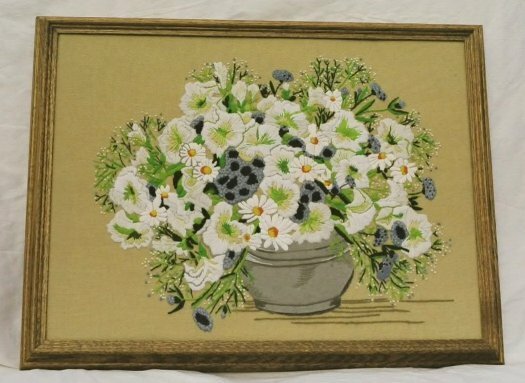 A crewel embroidery kit, purchased about 1978. It was to go in my grey and blue living room. Well, I moved out of that apartment in 1979 and finally finished the piece about September 2000. 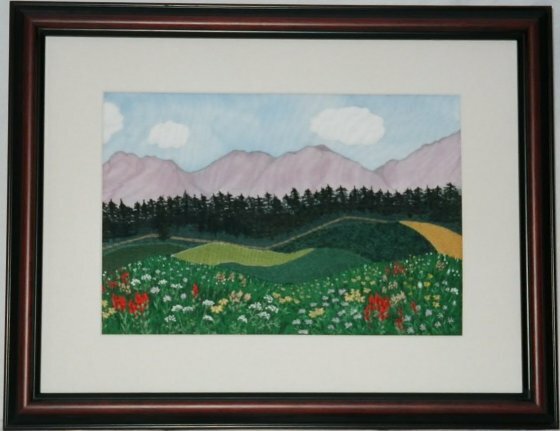 This landscape was inspired by a photo taken by Carl Hiebert, shown in his book "Gift of Wings". 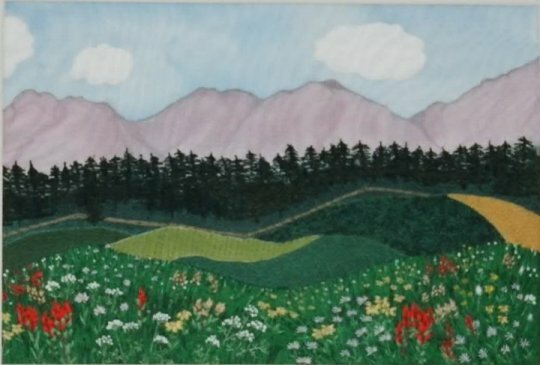 It was from the third course I took at Embroiderer's Guild. My teacher was fond of extravagant materials. I was plodding along copying the picture as realistically as possible, with embroidery floss. She brought me a piece of colourful, slubbed yarn from her stash and suggested it for one of the fields. That bit is the best part of the picture! I had painted the fabric during a course in fabric painting, with Elizabeth Duggan Litch and it lay in my sewing room for about 3 years. When I took a course in fabric collage from Marion Spanjerdt in the summer of 2001, I made the fish. I knew those fish had a lot goin' on when I saw them only half-finished. I thought they would work well with the landscape background as they were just too energetic to stay in the water. 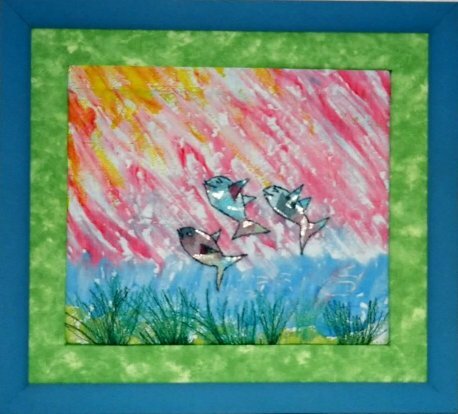 Completed, these fish want to get right up in the sky and experience the sun. They just don't care that it's bad for them! Another piece from the Spanjerdt course. I stayed at my sister's house and drove up to class on a quiet, sunny road, each morning. 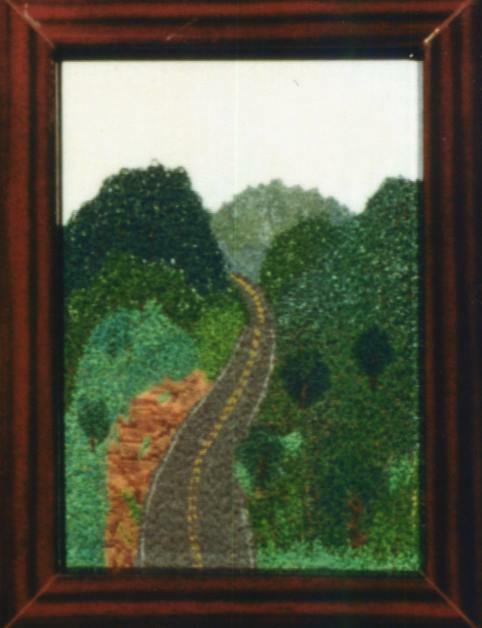 This is a representation, in machine embroidery, of my morning "commute" on Hwy 21 out of Haliburton. 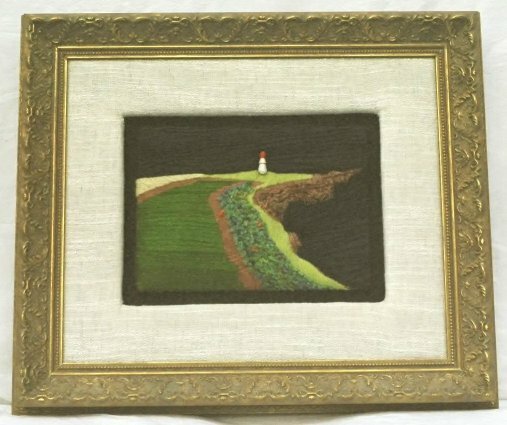 I had long wanted to do a landscape with mixed machine and hand embroidery, as a gift for my mother. 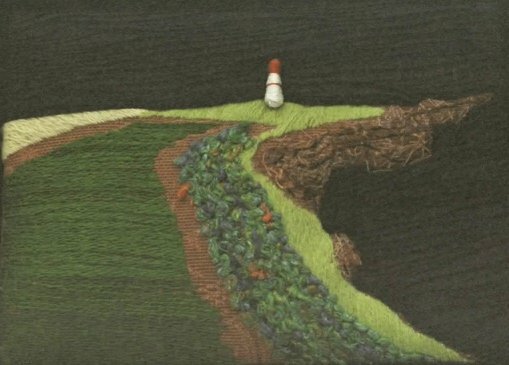 A course in landscape embroidery was offered in Elora in the summer of 2003. I took the course from Margaret Vant Erve and this is the result. The mountains are a reminder of the years we lived in British Columbia. I tend to make up fantasy flowers and throw them into embroidered situations with foliage which may or may not resemble anything in real life. However, Margaret is knowledgeable about plant life. So, in this picture, I embroidered actual flowers with correct greenery. Don't ask me what those crops in the fields are, though!